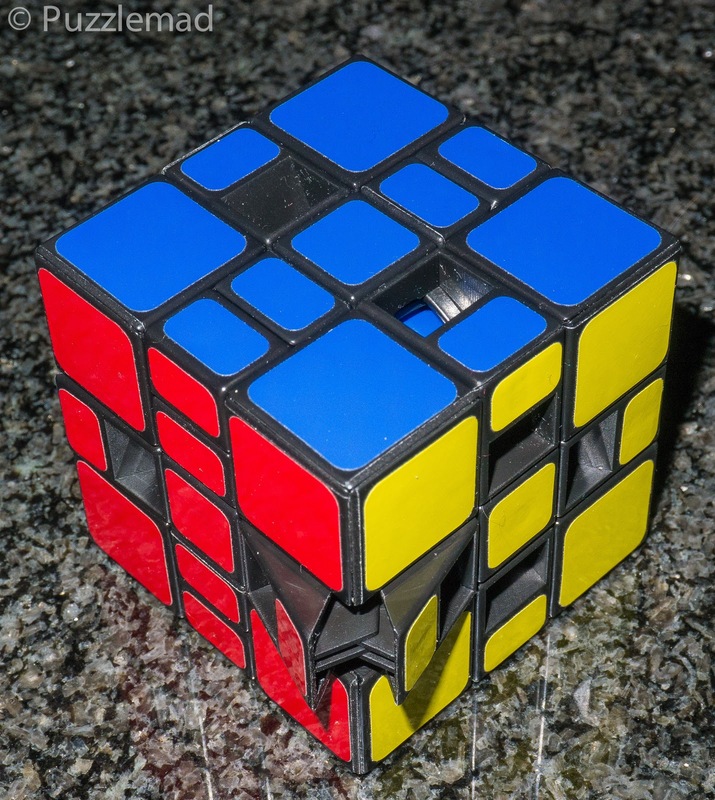 PuzzleMad: Thank Goodness for a Puzzle that Broke on me! I've not forgotten about my Popplock T11 - I'm just stuck.....still! Sorry to all you non-twisty puzzlers but I had to follow last week’s post with another one about a rather fabulous twisty puzzle. 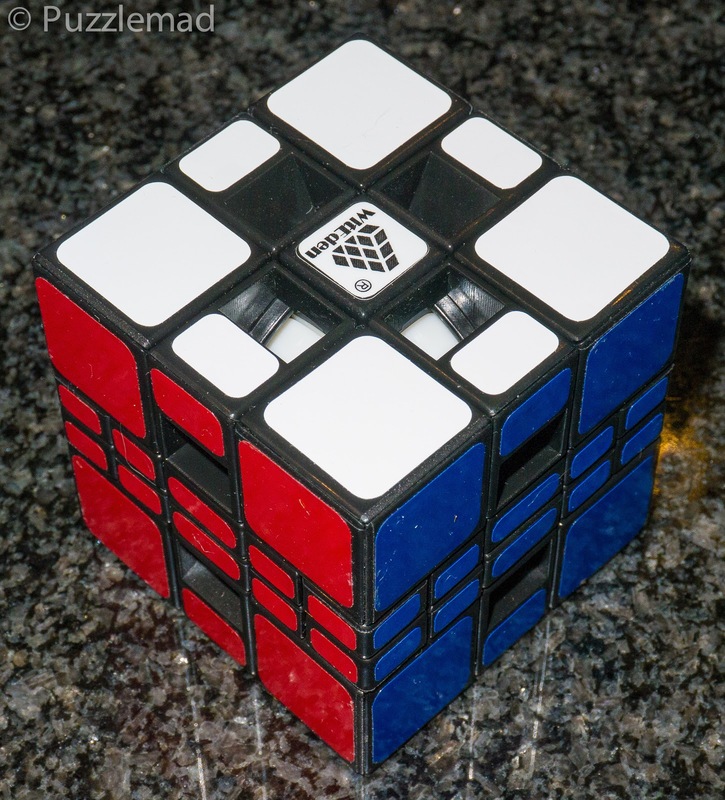 At the same time as Martin and Paul forced me to buy the 4x4x3 Mixup plus cube, they also bullied me into buying a couple of the Wormhole cubes. I had shied away from these when they first came out because they had frightened me to death! 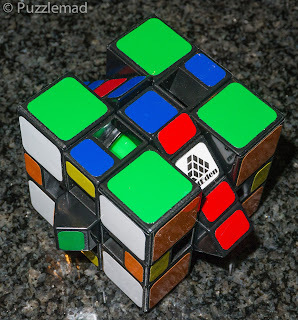 The Mixup plus puzzles with their 45° turns were already too much of a challenge for me at that stage of my twisty career and the thought of adding a puzzle inside of one of those monsters was just too horrific for my teeny tiny brain to cope with. Moving on 6 years, I’d reached an advanced enough stage of dementia to not remember how bad I am and to not remember that I’d deliberately stayed away. I ended up agreeing with their suggestion nearly a year ago and when the Mixup plus cuboid arrived, it was accompanied by the Wormhole II (PuzzleMaster link)and Wormhole III cubes. 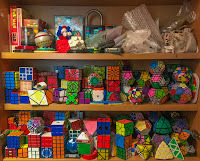 Having quickly looked at the Mixup plus cuboid and the 2 Wormholes when they arrived, I immediately shied away and put them somewhere “safe” in the twisty puzzle cupboard. Why did I shy away? Because just turning a single face makes odd things happen inside and on top of that it has Mixup moves too! This is after JUST 3 TURNS!!! 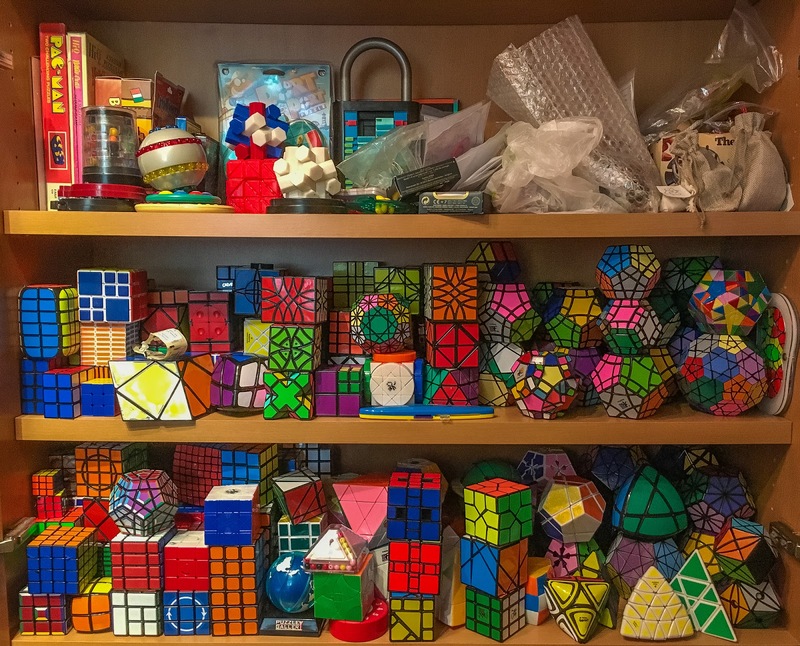 It took me nearly a year to get up the courage to try any of them and I enjoyed the cuboid so much I felt a little ashamed! Yes, it was time to “screw my courage to the sticking place” and play with the others. It was time to get out the Wormhole II and investigate. Straight away I could see that it looked and worked very similarly to the standard 3x3 Mixup cube (see left) which had been a fantastic and enjoyable challenge but this time there was something extra happening. First of all, the 45° turns were only possible in the 4 equatorial edge regions and in other 8 edge pieces, there were little windows. Through those windows there appeared to be another puzzle… colours were showing through and confusingly the internal colours sometimes moved with the external face and sometimes didn’t! I began to investigate carefully and within a few minutes of exceedingly careful movements I had to call Houston…I had a problem! Yep! I’d scrambled it beyond my ability to get it back to the beginning. Damn! Ok in for a penny, in for a pound… I did the whole thing! OMG! I did not think I should just stuff them back in because quite a few pieces had shot out and I did not think that I could put them back the way that they came and I might end up with an impossible to solve puzzle. So, I had no option but to remove the rest of the pieces and solve the inner portion and then reassemble the outer cube later. 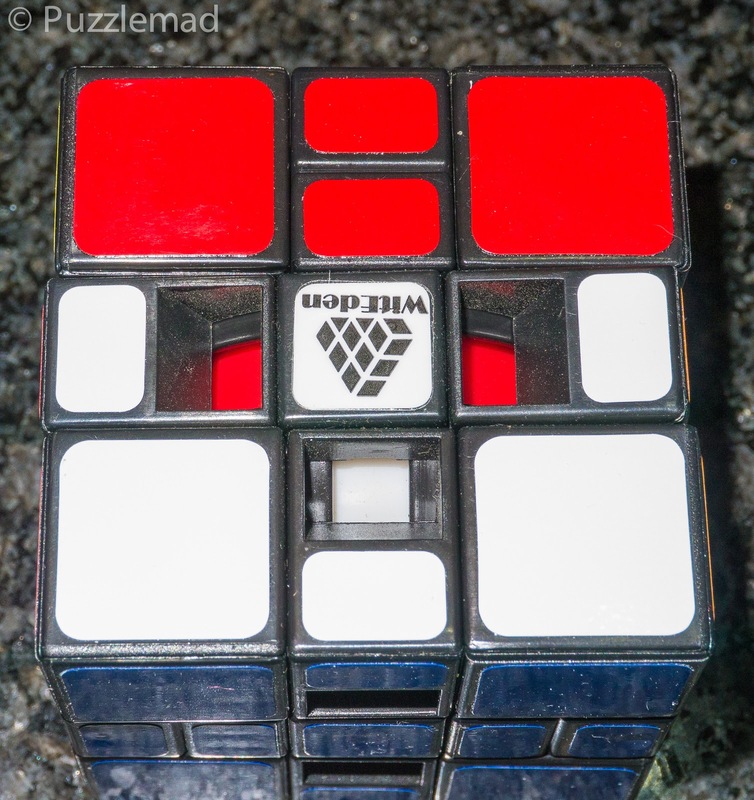 It was time to just go ahead and solve the inner 3x3. How hard could it be? 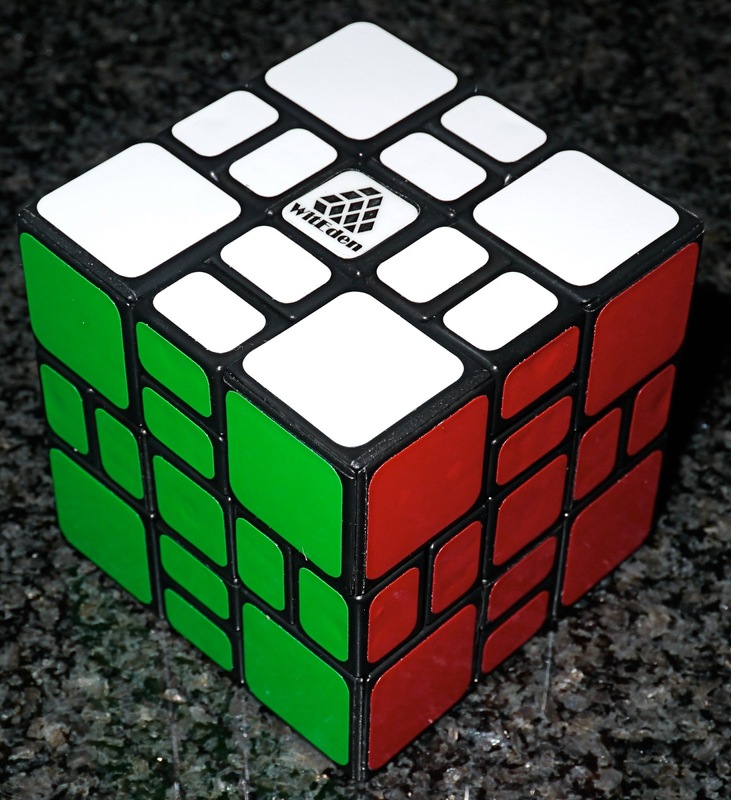 It's just a 3x3 with big corners....or is it? GULP! Except, blush, I couldn’t understand it! Things weren’t working right! 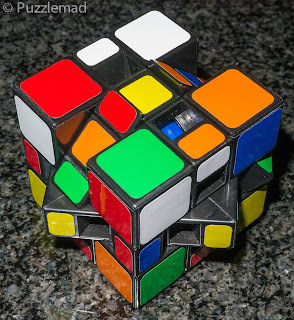 It took me a half day of playing with my mostly disassembled puzzle before I understood what was happening and why I’d really struggled before it flew apart. 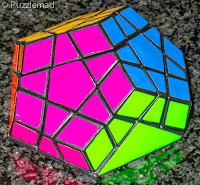 It would seem that the sudden suicidal destruction of this puzzle had been a real blessing. 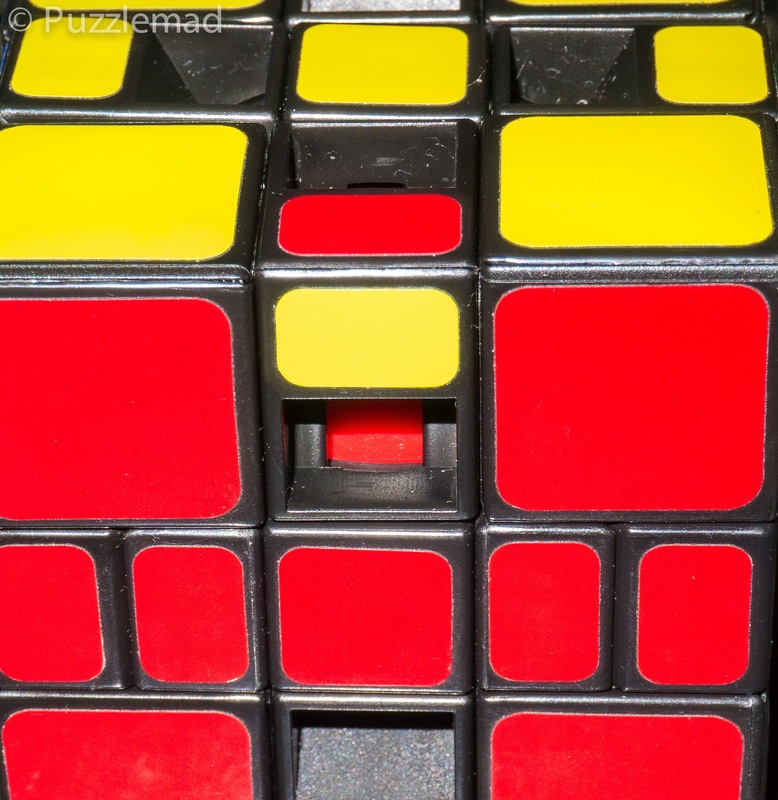 Without being able to see inside, there was no way that I would have been able to understand what was happening in this puzzle. I made a video below to show you how it works. I apologise that I seem to have played with it off to the right side of the video - I'm a rank amateur! 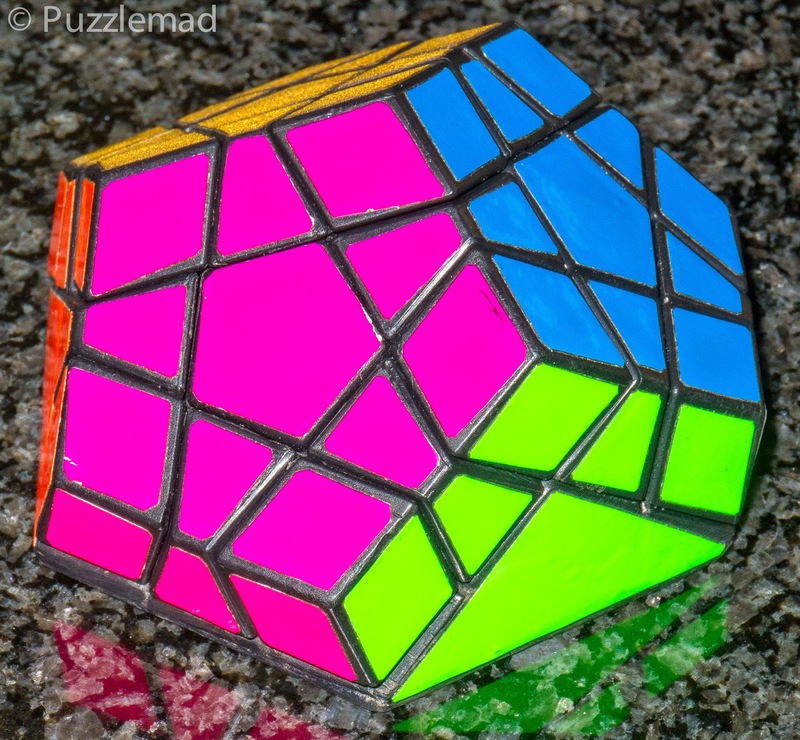 It would appear that the internal puzzle is effectively a corner block puzzle or functionally equivalent to the Halfminx puzzle with only 3 usable sides. 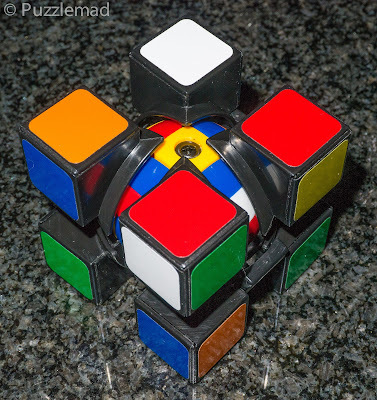 This means that the interior (and later the exterior) has to be solved without moving the 3 sides containing the green/white/orange corner piece. It sounds horrifying (and it was an awful thought to me when I realised what was going on inside) but in my efforts to solve just the inner puzzle with outer corners in place, I realised that I knew a possible method and it was VERY basic…it involved nothing more than the use of a 4 move sequence - the edge piece series (yes, you read that correctly, just 4 moves!) I can hear you all shouting out in disbelief (I really should restart my meds to prevent those voices) and I reiterate that the vast majority of this puzzle is solved using nothing more than a 4 move algorithm! It’s “easy”!! 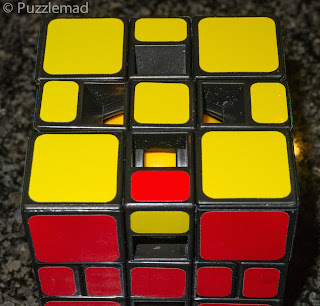 Having used my edge piece series (EPS) to solve the inner puzzle and then reassembled the external puzzle around it, I quickly rescrambled it and played again. This is all part of the fun and is very enjoyable - "Just" flip that edge.....except the windowed edges cannot be flipped. Oh dear! A little thought© and I had flipped something and undone everything else! 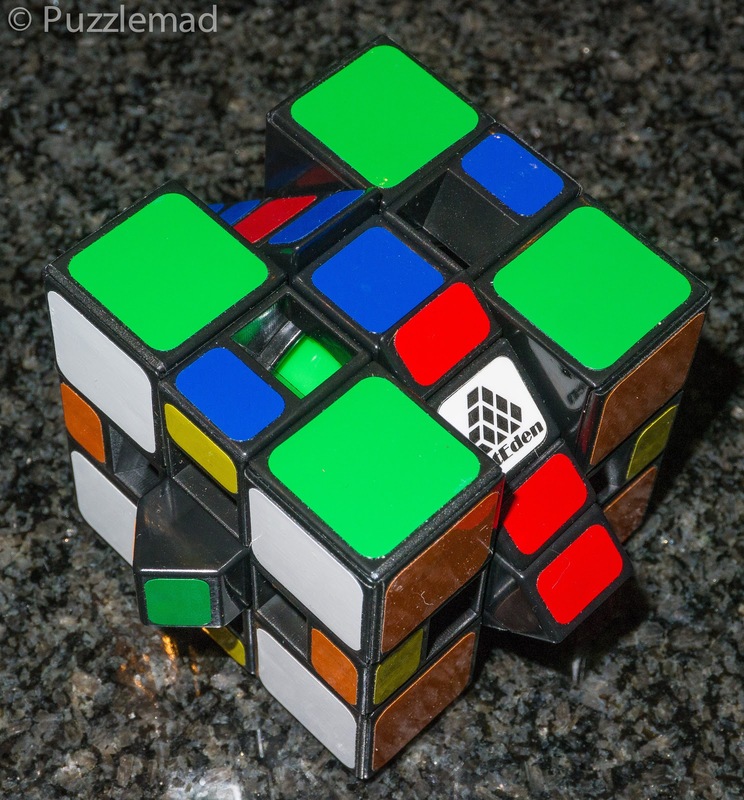 Laboriously matching up and solving the puzzle again showed me that breaking the puzzle the first time had been a very good thing to do - it was solved. Wormhole III - appears to be a 3x3x4 Mixup plus WITH inner cube! NICE! I've done it several times now and have to say that yet again, Martin and Paul were absolutely correct! This is a fabulous challenge that involves understanding and then planning an attack with some very serious constraints. I have still got the Wormhole III left to solve and will definitely get to that soon - it appears to be a 3x3x4 Mixup plus cube (which I don't own) with an interior cube visible through the 8 windowed pieces. I might also have ordered a couple more goodies from Martin's store too which should arrive pretty soon. Don't tell Mrs S - Whack! Ouch! Too late! 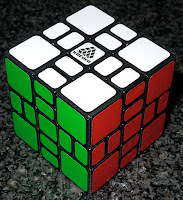 At some point, I will make a post with videos to show all you non-twisty puzzlers how to solve a cube using nothing more than the 4 move edge piece series. This means there is nothing to memorise and just some understanding and thought to be used. Leave a comment below if you would be interested to see this. 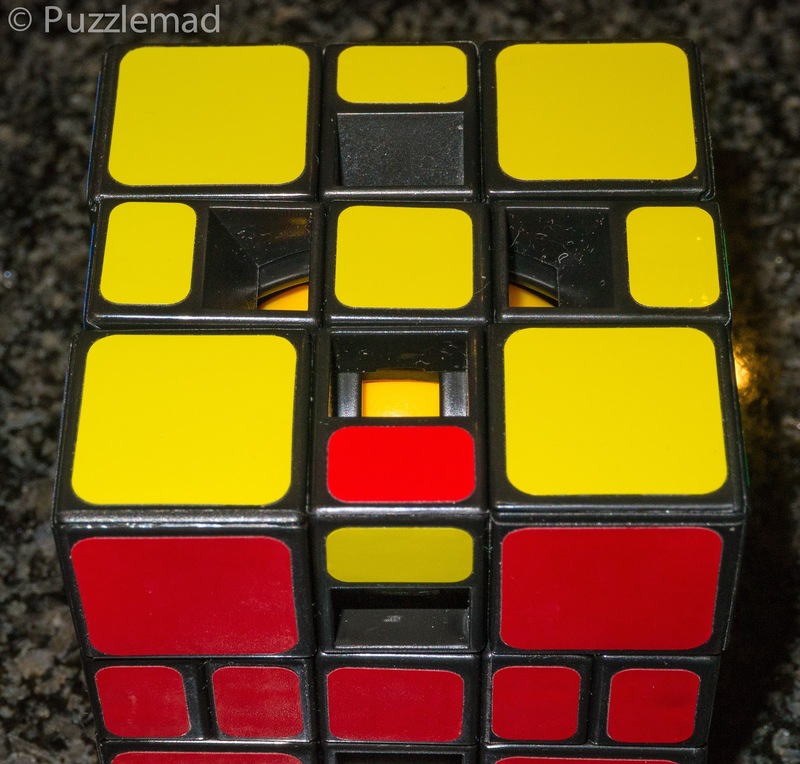 Great post Kevin, I recall coming up with quite a convoluted solution to solve this one! I think I need to get them out again and have a go at your method. 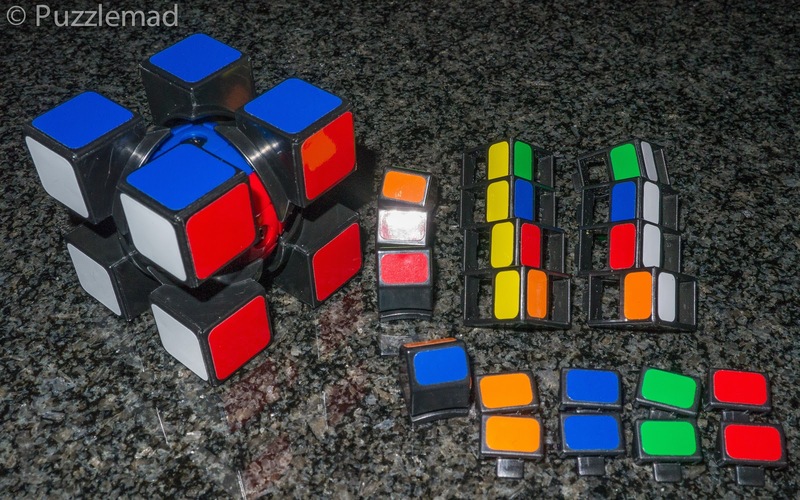 Video sounds great, I'm always up for watching anything puzzle related! Glad you enjoyed it Paul. 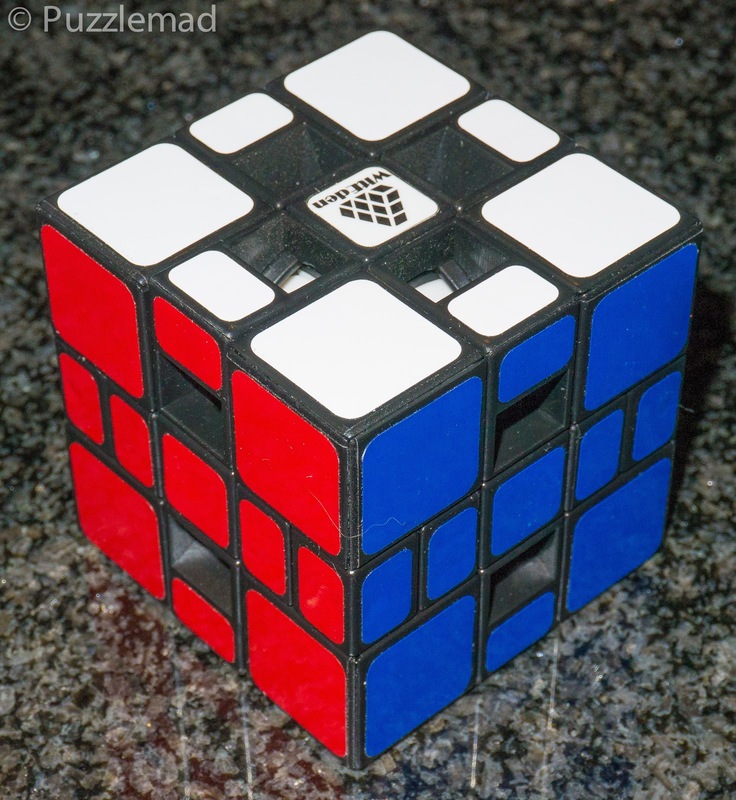 It's a fun solve when you try using just the edge piece series. I'll do my best in the post with videos but it won't be aimed at you because you know it already. I'm aiming to teach other puzzles that twisties are not to be feared.